This is by far my most popular creation! Everyone loves the unique and versatility of this piece. This is made with a thick 18 gauge aluminum/allow washer (other washer options are pictured below) that is hand stamped with the Latitude and Longitude Coordinates for a specific location. In this case a home address which makes this perfect for a loved one that is away from home to remind them of you and where you are. This could make up as a very cute Best friends bracelet set as well in which you could exchange coordinate locations of a best friend that are near or far. 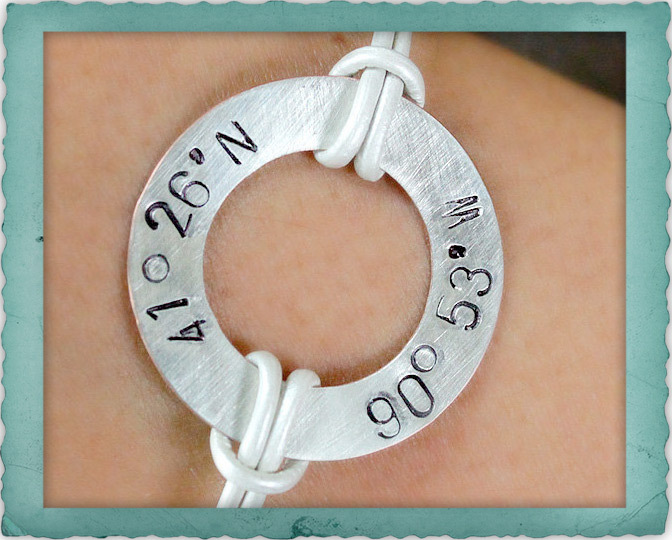 Coordinates that are also popular is where you were proposed to or married (great for a wedding or anniversary gift), where a child was born, your hometown or location of an oversees husband or wife. Anything that has a special heartfelt meaning this bracelet will hold that location close to your heart.